With only 128 rushing yards, "we run this state" might not be the best theme for the game. Maybe "we passed them by?" After a frustrating outing against Kentucky, it was important for the offense to get off to a good start. 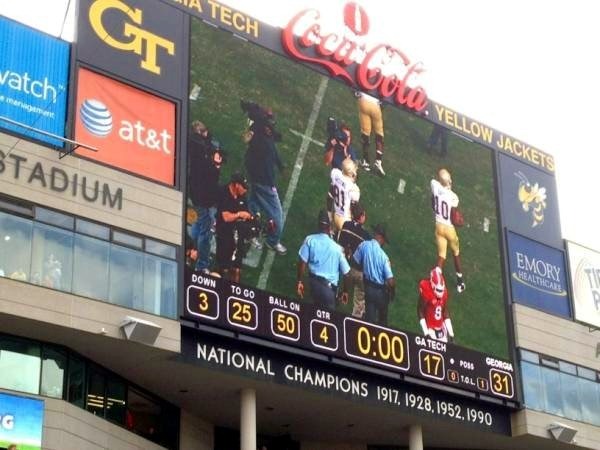 Tech is always easier to handle if you can get up on them, and Georgia avoided the scenario that put Clemson in a hole in Tech’s only significant win of the season. Aaron Murray’s typical game usually starts slowly, but he was on from the beginning of this one. His only first quarter incompletions were a catchable throw to Marlon Brown on a tightly-defended route and and interception off a throw on which Murray was hit. He was a perfect 4-of-4 on Georgia’s first scoring drive and 5-of-6 on Georgia’s next scoring drive in the second quarter. His 32 touchdowns in 2011 has obliterated the Georgia single-season record. Murray’s fast start was made possible by outstanding pass protection. There was a breakdown on the intercepted pass, but generally Murray had as much time as he needed to pick apart a porous pass defense. It was a little more crowded on running plays, but that was a function of Tech’s decision to stuff the run and count on another shaky start by Murray. Fortunately both Murray and the playcaller were prepared to exploit those opportunities in the passing game. Was that particularly smart strategy by Tech? Murray threw all over the Yellow Jackets a year ago. Taking away the run might seem like first principles in ordinary circumstances, but this was a Georgia running game without its top two options and little faith in its third. The Dawgs were putting cornerbacks in the backfield. If you’re going to overload resources to take away an element of the Georgia offense, is the running game really what you’d choose? With the focus on the passing game, it was enjoyable to see the running game take over to ice the game. Any hope Tech had of a quick shift in momentum with six minutes remaining in the game disappeared as Georgia started to pound the ball. Though the Dawgs ended up with no points, the five-minute drive was a giant dimmer switch on Tech’s chances of a miracle comeback. Speaking of that final drive, it was gratifying to see Ken Malcome contribute. His talent wasn’t so much the issue keeping him off the field. If he’s starting to put the issues that led to his near-transfer behind him and working to earn playing time, we see that he brings something to the table. With the status of Crowell, Samuel, and even Thomas changing on a week-to-week basis, the opportunity is there. Moving to defense, Georgia had pretty good success stopping the dive play – the lynchpin of any option attack. They held David Sims to only 36 yards on 12 carries. Garrison Smith’s play in relief of Tyson was huge, but the entire defensive front did a great job holding down the middle. With the dive covered, the next big job was avoiding the big play. Tech’s longest run was a 27-yard gain on a pitch, but they only had one more run longer than 20 yards. Workhorse backs Jones and Smith couldn’t manage anything longer than 14 and 16 yards. Tech had some success with inside handoffs, but Grantham soon added that to the list of effective adjustments he’s made this year. In another nod to coaching, the tendency for Tevin Washington to keep the ball on plays close to the goal line had to be noticed. Georgia was ready for the keeper on that early third down on their own two, and Washington was hit for a loss. Holding Tech to 3 instead of 7 there kept Georgia out in front and let them open up an 11-point lead on their next possession. Special teams had a second straight quality performance. Georgia was bailed out on a poor field goal operation by Tech’s timeout, but otherwise it was a solid day. Both Walsh and Bogotay buried kickoffs. Butler is back. Boykin had one of his best kick returns of the year. Watching LSU turn their Arkansas game on a punt return, it’s an unfortunate development this year that Georgia has all but abandoned the punt return or punt block as a strategic weapon. Some of Richt’s players (Gray / Flowers / Henderson) just about made their names returning punts. Being burned several times on fakes has led Richt to default to punt safe in all but the most extreme 4th down situations. With field position so important in LSU’s games this year, ceding 10 or so yards on each punt by choosing to defend the punt rather than return it is something to watch next week. I love scores that bookend halftime. It’s the biggest payoff from winning the coin toss. Georgia turned a close 14-10 game into a more comfortable 24-10 margin without Tech’s offense touching the ball.